Today I am taking a quick look at a fairly small street in Kitchissippi, but one with a somewhat interesting history nonetheless. I was inspired to take a second look at this street after a question from a blog reader regarding access to Tweedsmuir off Belford. As I had done a house history on Belford a few years ago, I dusted off my old research, and recalled that there are a few little stories of interest attached to this small, hidden crescent in the Kirkwood/Iona area. Former Street Name: Belford Street and Bruce Street (what is now Belford Crescent was originally two separate streets). Name meaning: Unfortunately I have never been able to confirm exactly who it was named for, but it was most likely named to honour one of, if not both of two brothers who were prominent citizens in Ottawa, Charles A. Belford and John A. Belford. Charles was only 11 years old when he became a page in the House of Commons. He developed a bond with Sir John A. MacDonald; in fact, when Sir John A. passed away in 1891, Charles carried the mace at his funeral. He would go on to a 40-year career with the Canadian Atlantic, Grand Trunk and Canadian National Railways, where he became one of the world's top experts on transportation systems. The Journal noted at his retirement that "offhand he can quote mileages in all sorts of out-of-the-way places in Europe, Asia or Africa". During WWII he was transit controller for the Ottawa and district area under the Department of Munitions and Supply. His brother John was a lumberman, who later became director of the Central Canada Exhibition, and was very much involved in the political and social scene of Ottawa. How named: By the developer, Carleton Realty, who selected the names of the streets created by their new subdivisions in the early 1940s. 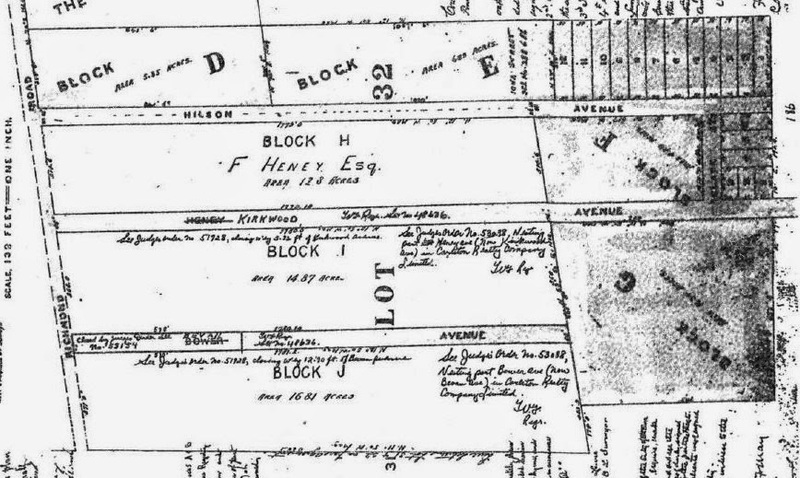 The Heney family had acquired the north half of lot 32 of Nepean Township (the area between the back property lines on the east side of Hilson, west to the back property lines behind the east side of Tweedsmuir, and north of Iona Street - which was the dividing line between the north and south halves of the lot) in 1854. John "Buffalo" Heney purchased this property and opened a farm on the land. One of Ottawa's oldest buildings still exists on the Richmond Road, the stone "Aylen-Heney House" at 150 Richmond Road near the corner of Kirkwood. In 1892, the elderly Heney transferred ownership of the property to his son Frederick A. Heney, and soon after passed away in 1896. The elder Heney was involved in many business affairs, and so it is difficult to pinpoint exactly when the family's farming business ceased, but it was likely sometime around the 1880s to early 1890s. In 1899, after studying law in Toronto at Osgoode Hall, Frederick A. Heney returned to Ottawa and built an incredible 18-room mansion on the site of what is now the Canadian Bank Note Company. Fred would go on to become one of the Township's largest land owners, and was reeve of the Township from 1898 to 1911. His business interests were vast, and would take paragraphs to cover. In 1899, Plan 186 was filed with Carleton County, dividing parts of lot 32 into blocks. This was a plan splitting part of both the Heney property and the Holland property in the south half of lot 32. It even created three new streets: Hilson Avenue (named after George Holland's wife Alison Hilson Holland) which still exists today, Heney Avenue (now Kirkwood), and Bower Avenue (now Bevan). Block J would contain the future Belford Crescent, but for now it was empty farmland. original Hayes homestead, which had been occupied until the late 1890s). the center of the photo is damage to the original negative unfortunately). Portions of the farm were sold off over time, including to the R.L. Crain Company, but by the 1940s, John Heney still owned several pockets of land south of Byron Avenue. On May 27th, 1944, Heney sold to Carleton Realty the remainder of Blocks I and J from the old farm property, for the sale price of $7,000. Carleton Realty was one of, if not the first large developer firms in Ottawa. In the Westboro, Laurentian View and Island Park Drive areas, including right here on the former Heney farm, they created Ottawa's first true subdivision housing project. During the latter stages of WWII, the federal government began to open up funds via the National Housing Act, to ensure that housing would be available for veterans upon their return. After WWI, the Canadian government had been ill-prepared for the return of soldiers who had been away. These young members of Canada's forces had come home to few jobs, and little to no available housing. It was a disaster for Canada, and the government made it a priority to ensure the same thing did not happen after WWII. Carleton Realty was created by a triumvirate of top contractors in Ottawa: Frank Shouldice, Ken Green and C.A. Johannsen with this very purpose in mind. 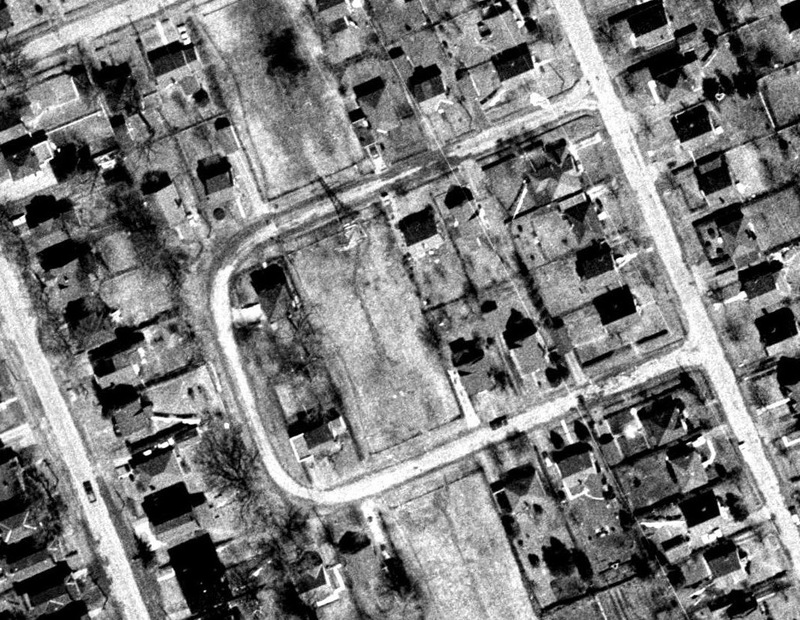 With the funding available from the Canadian government, the group assembled plans for subdivisions in the west end (and also initially in Eastview), and in 1943 began constructing homes of a smaller size, with similar floor plans and layouts, though still having somewhat unique features. Some Westboro residents at the time were not happy about these plans, and worried that the community was being filled with homes that would cheapen the appearance of the established neighbourhood, and perhaps even sit vacant and unwanted. This of course proved to be untrue, as indeed the homes proved quite popular, and though we are seeing them being replaced in the new century for larger homes and the dreaded semi-detached doubles, they did serve the area well for many years, and overall the initiative was a success for Carleton Realty. Not only did they build quality homes at a profit to themselves, but they also quickly turned the sparsely populated area of central Kitchissippi into a well-filled and popular neighbourhood, and most importantly, they helped ensure that ample housing was available for the thousands of soldiers returning home in 1945-1946. A few months after purchasing Blocks I and J from Heney, on September 27th, 1944, Carleton Realty filed Plan 443 with Carleton County, which subdivided Block I (east of Bevan) and Block J (west of Bevan). 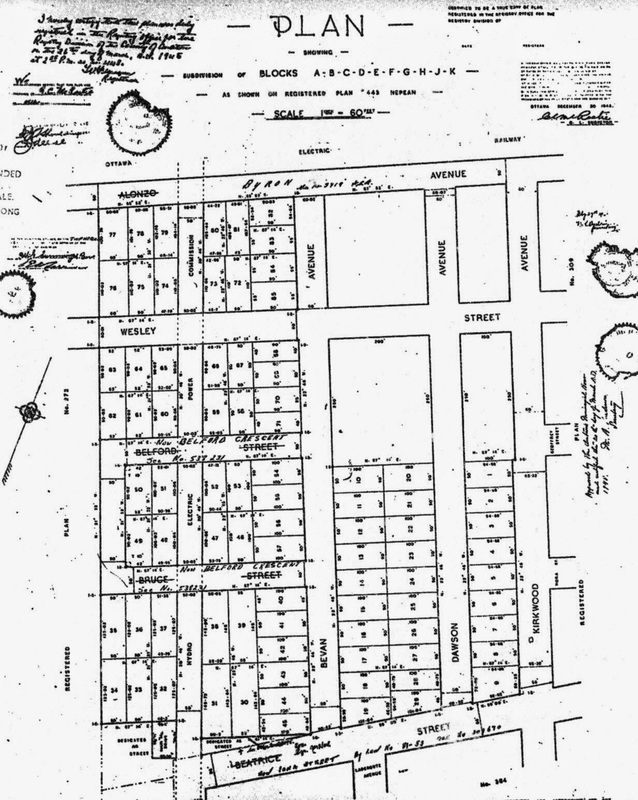 Block J was split into 8 smaller lots, each about an acre in size, while Block I had two large lots, plus a handful of smaller, more standard residential lots. The plan most importantly, created new streets Bevan (renamed from Bower), Dawson, Belford, and Bruce. 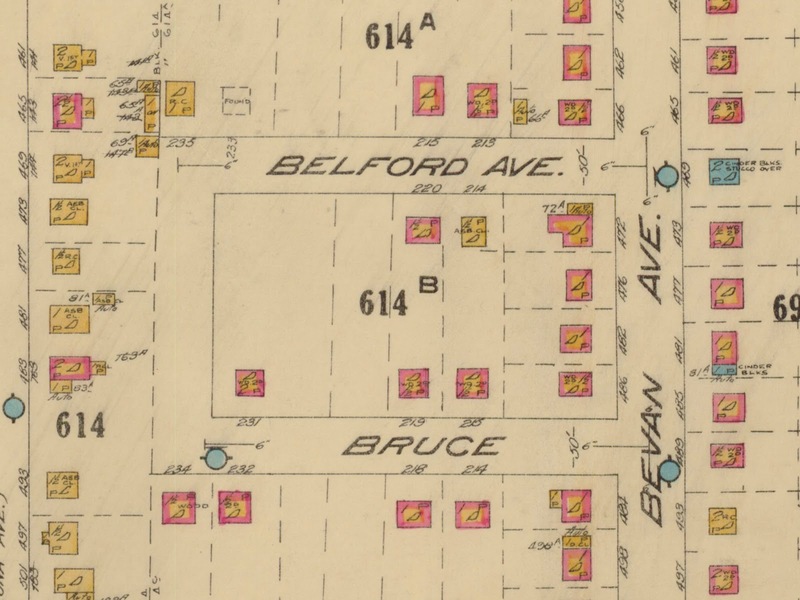 It is important to note here that what is now Belford Crescent was actually two separate streets on the original 1944 plan: "Belford Street" and "Bruce Street". Even though the street actually did function as a crescent, the streets would remain named this way for another 23 years, until the crescent was formally established. 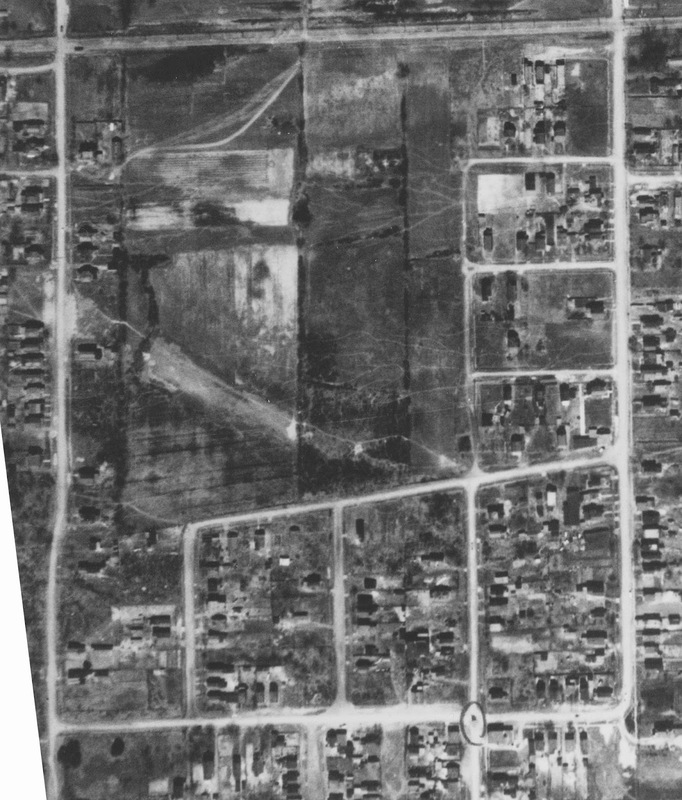 The bizarre initial design of Carleton Realty's subdivision was modified in the spring of 1945, when the company filed a new Plan 448 (seen at left), replacing Plan 443. The new plan broke up the larger 1-acre parcels into more regular, typical builder lots, mostly around the 50x100 size. In May of 1945, the Township of Nepean published their "Local Improvement Notices" listing all the municipal work to be done in the summer of 1945. Included in that list were the construction of sewers on Belford (at a cost of $1,292) and on Bruce ($1,444), as well as the the construction of water mains on Belford ($1,445) and Bruce ($1,573). This work would have been complete by the fall of 1945. In 1945, Carleton Realty began building homes and selling lots from plan 443. 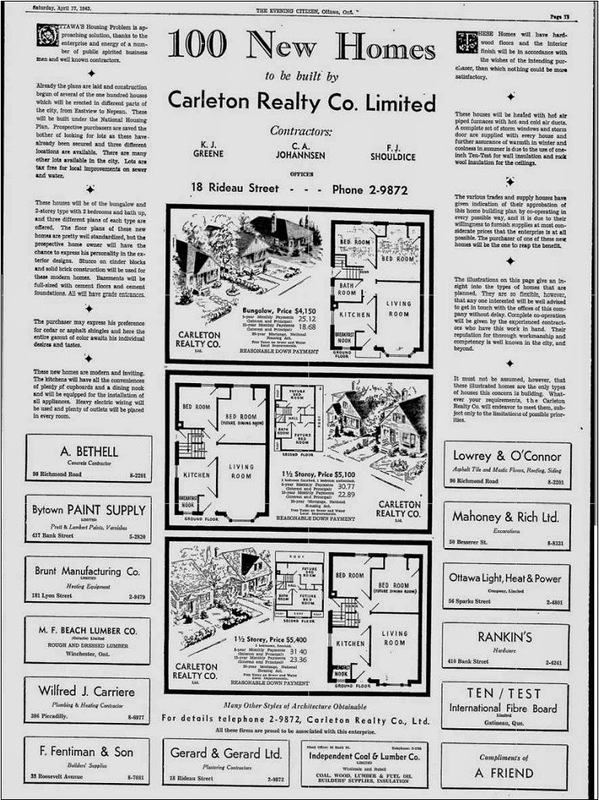 An article in the Ottawa Citizen on May 23rd, 1945 indicated that the Carleton Realty Company had begun construction of 85 new homes in “Heney Park West”, with already 32 of the homes sold. Homes were sold from $5,100 and up, purchasable for as little as $500 to $1,000 down, and all homes featured “concrete foundations, furnaces with hot and cold air ducts, built-in baths, solid masonry walls, insulated walls and ceilings, hardwood floors, and good plaster interior finish with asphalt roofing color to suit owner.” The vast majority of homes built in this community were built by Carleton Realty itself, though some lots were sold to individual buyers, and the house built privately. The first to buy on what is now Belford Crescent was Burton and Hertha Darlington, a young couple who had married just five years prior. 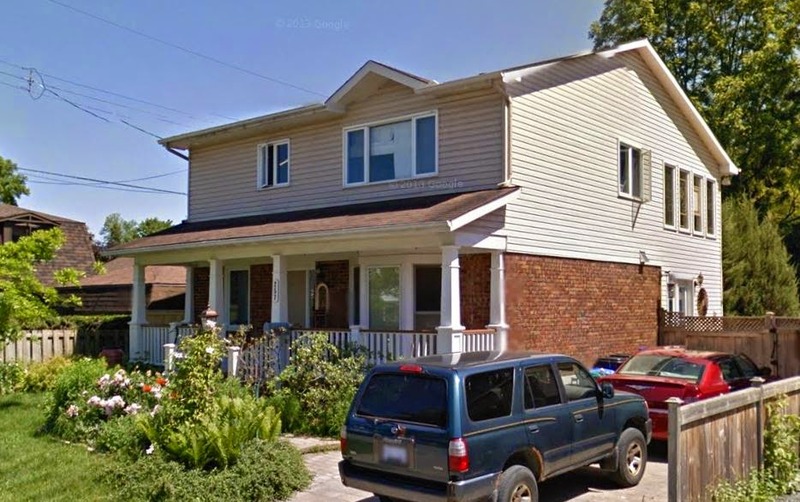 They purchased lot 39 on Bruce Street in mid-1945, and soon after construction began on the first house on the street, which is now 257 Belford Crescent. Sadly, on February 12th, 1946, long-time land owner Frederick Heney passed away at age 76 following a lengthy illness. He passed away just short of seeing the farm property, which had now been in his family for over 100 years, really begin to develop. If he had lived even two more years, he would have seen quite the striking change. Less than a year after his passing, his amazing large mansion, even at the time called one of Ottawa’s top showplaces, was torn down to make way for the new Canadian Bank Note Company building. (I'll definitely have an article dedicated to the Heney mansion soon - complete with some great photos that will surprise you, and make you despise the Bank Note building). So by early 1946, there were two completed homes on Bruce Street: the Darlington home at what is now #257 Belford (but then was 214 Bruce Street); and Lloyd and Florence Horricks had a home built on lot 36, which is now #243 Belford (then 232 Bruce Street). The Horricks didn't remain on the street for too long, and the only newspaper hit I could find for them during their brief stay was an amusing note in the newspaper in 1948 about a loose dog charge (see below). The news media in Ottawa even after WWII, still had somewhat of a small-town feel to it. There were also two houses under construction at this point: Frederick and Adelaide Rowland's home on lot 38 (218 Bruce, now 253 Belford Crescent) was nearly completed in May of 1946, while the foundation was just in on Charles F. Russell's home on lot 49 (231 Bruce, now 242 Belford Crescent). In April of 1946, the first building permit on the Belford Street segment of the crescent had been taken out on lot #50 (the future #232 Belford), though the house actually would not be built for several years. The story of the Carleton Realty Company actually has a bad ending. The firm went out of business in 1947. 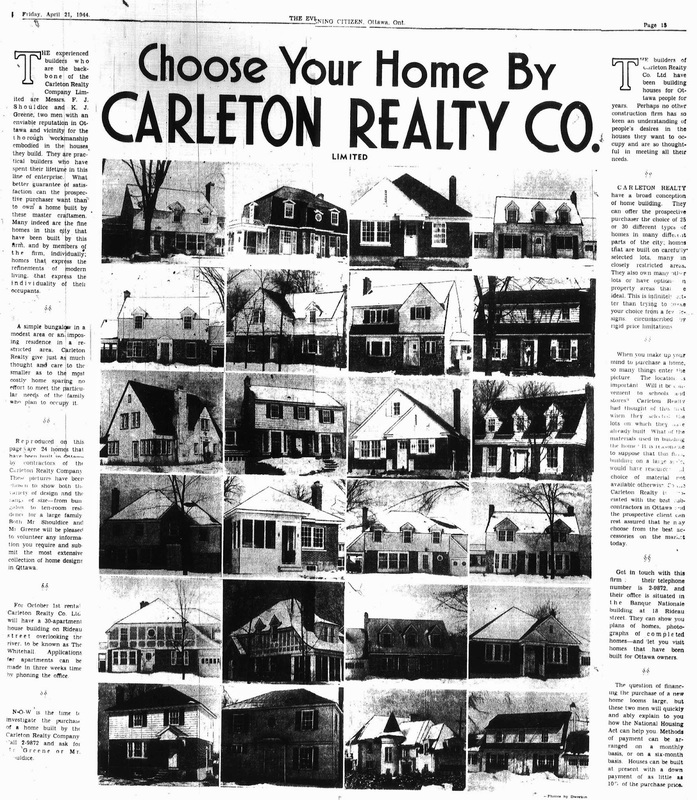 The Ottawa Citizen reported on June 1st, 1947, that the Carleton Realty was putting in an application for bankruptcy and that most concerning were the veteran homes that Carleton Realty had begun construction on. They had started a project in 1946 to build 200 low-cost homes for veterans “principally of the bungalow and two-storey type and mainly in the Heney Park area of Laurentian View In the majority of individual cases, the war veterans had financed the building and purchase of houses through re-establishment credits, gratuities and loans of the Central Mortgage and Housing Corp. The original contract prices for the homes ranged from $6,000 to $7,000 it was reported, and many veterans had used all available resources for construction costs. These ex-servicemen were said to be in financial difficulty with the prospect of losing their homes unless some organized assistance is provided following the assignment of the building company.” Later in June it was reported that 104 claims had been made against the Carleton Realty Company, with a former executive stating that the bankruptcy had occurred due to a “shortage of labour, materials and increased costs.” Following the bankruptcy fall-out, it was reported that many soldiers were still in dire risk of losing their unfinished homes, as they were potentially years away from being able to afford to finish the construction on their homes. For those with finished homes, liens had been placed against the homes by the companies who had done portions of the work, and the owners were left to deal with these debts. A very unfortunate ending to what initially promised to be a positive endeavour. The principal directors of the company (Greene, Shouldice and Johannsen) would still find great success in the contracting business in Ottawa following Carleton Realty's demise; in the end a small blip on the great careers each of these men had. over just a short period of time. (Pink indicates brick veneer, yellow indicates wood frame). 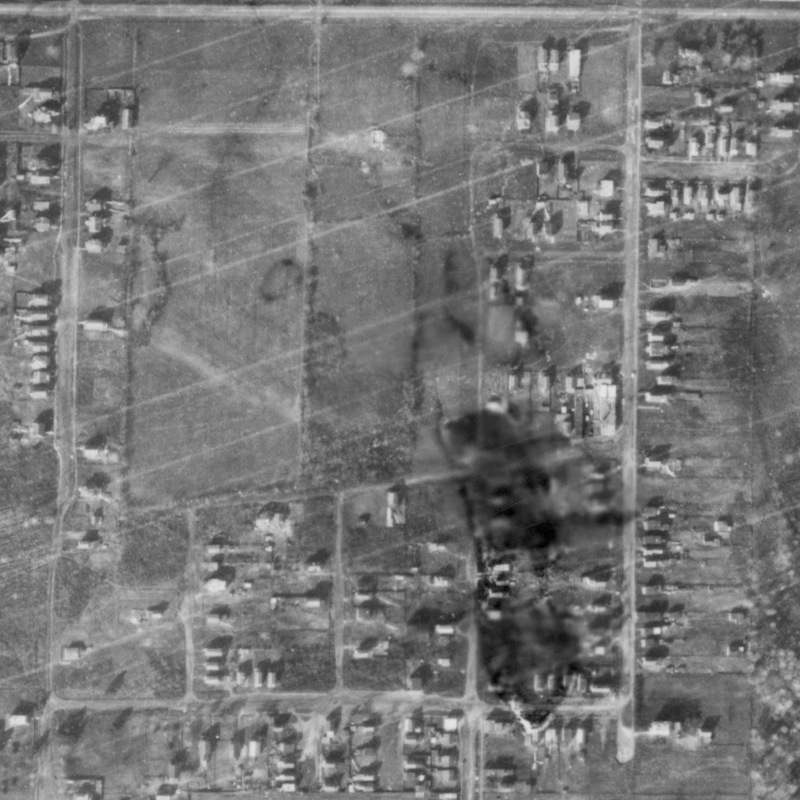 Above is a look at the development of the area by 1948. To specifically address the question asked by the commenter to my "History of Tweedsmuir Avenue" article, it does appear that possibly for some of the residents of Tweedsmuir that they would have been able to take advantage of the crescent to have garage access off Belford. The Fire Plan above definitely shows that at least the one house had a garage that could have received a car from Belford. But this would only have been after the street was opened up in 1944-1945. Below is an aerial photo from 1965 showing the built-up street, and it appears that garage from 1948 was gone by this point anyways. 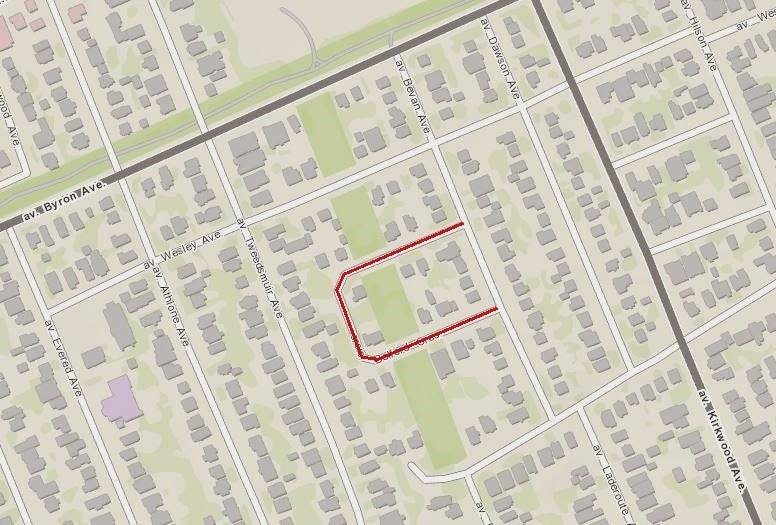 On December 12th, 1967, at 2:30 p.m. at the Nicholas Street Court House, the Corporation of the City of Ottawa presented a proposed by-law to Judge Peter Joseph Macdonald, recommending that Belford Avenue and Bruce Street be officially linked to form one single street, to be called Belford Crescent. This was based on the recommendation of the Street Names Advisory Committee of the Ottawa Planning Area Board, made to the City Clerk in August of 1967. The proposal was accepted, and the change came into effect on January 1st, 1968. This article would not be complete without mentioning some of the long-time residents of Belford Crescent, in particular Clifford and Frances Young, seemingly the last of the "originals" who resided at 231 Belford from its construction in 1949 until just recently (while researching this article, a google search revealed that Mrs. Frances Young just passed away this past fall at the age of 97). Also residing long-term: Eric and Frances Chipper lived at 252 Belford (formerly 219 Bruce) from it's construction in around 1947 until a few years ago; Arthur and Eileen Abson resided in 239 Belford (formerly 234 Bruce) from 1948 until the late 80s; and Archibald and Muriel Delaney, who built 220 Belford in 1947, and remained there until 1979 at 220. (My apologies to any other long-time residents I may have left off the list, I did my best with the lists I had, without doing individual house histories).